Legendary British theoretical physicist and intellectual giant Stephen Hawking is dead. He died peacefully at his home in Cambridge, England, at age 76. We are deeply saddened that our beloved father passed away today. He was a great scientist and an extraordinary man whose work and legacy will live on for many years. His courage and persistence with his brilliance and humor inspired people across the world. He once said, “It would not be much of a universe if it wasn’t home to the people you love.” We will miss him forever. The acclaimed British theoretical physicist, cosmologist and author was not only a great scientist who revolutionized our scientific understanding of black holes and the nature of the universe, he was also a great science communicator who achieved a global celebrity. Appearing in numerous popular TV shows, Hawking, with his unique synthesised voice, became a fixture of popular culture, a living symbol for advanced theoretical work in the sciences. 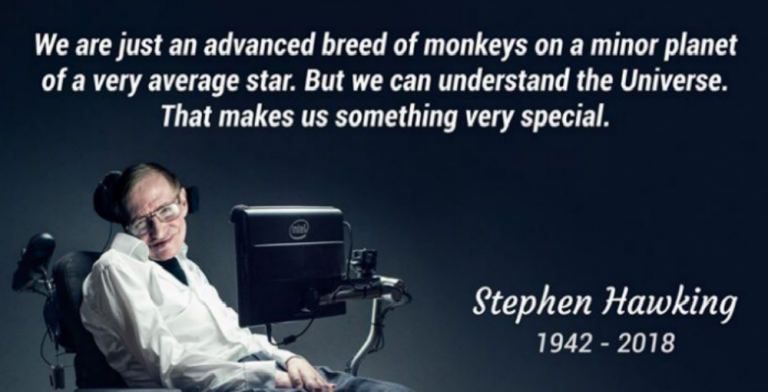 In addition to, or because of his work in science, Hawking was also an outspoken atheist. However, in his follow-up book about the quest for the theory of everything, titled “The Grand Design,” Hawking said the mechanism behind the origin of the universe was becoming so well known that God was no longer necessary. Before we understand science, it is natural to believe that God created the universe. But now science offers a more convincing explanation. What I meant by ‘we would know the mind of God’ is, we would know everything that God would know, if there were a God, which there isn’t. I’m an atheist. We are each free to believe what we want and it is my view that the simplest explanation is there is no God. No one created the universe and no one directs our fate. This leads me to a profound realization. There is probably no heaven, and no afterlife either. We have this one life to appreciate the grand design of the universe, and for that, I am extremely grateful. Speaking with the Spanish-language paper El Mundo during the 2014 Starmus Festival Stephen Hawking said he believes that humans are not alone in the universe, and that meeting extraterrestrial life could be like Christopher Columbus coming to the Americas: “Which didn’t turn out very well for the Native Americans,” Hawking warned. The idea that we are alone in the universe seems to me completely implausible and arrogant. Considering the number of planets and stars that we know exist, it’s extremely unlikely that we are the only form of evolved life. It (space travel) could prevent the disappearance of humanity by colonizing other planets. Concerning evolution and the Big Bang theory, Hawking declared that God is not a necessary condition for the creation of the universe. Instead, Hawking argued the Big Bang was an inevitable consequence of the laws of physics. The universe can and will create itself from nothing. Spontaneous creation is the reason why there is something rather than nothing, why the universe exists, why we exist. It is not necessary to invoke God to set the universe going. …Because there is a law such as gravity, the universe can and will create itself from nothing. In short, physics was the reason for the Big Bang, not God. Hawking, always the advocate for science, took a very public stand against Donald Trump during the 2016 presidential campaign. Prior to November’s election, Hawking and 374 other scientists warned Americans that Donald Trump was unfit to serve as president because of his controversial and profoundly mistaken position on climate change. Human-caused climate change is not a belief, a hoax, or a conspiracy. It is a physical reality. I believe the simplest explanation is, there is no God. No one created the universe and no one directs our fate. Bottom line: Stephen Hawking – scientist, atheist, intellectual giant, is dead at age 76. He will be missed.